Somewhere out there in academia - - though probably not at UW-Stevens Point where the history degree is being axed - - there's a master's or Ph.D thesis in the works to explain how Wisconsin GOP Gov. Scott Walker could go from featured speaker at his party's 2016 national convention to defeated incumbent just two years later. He did it by his own clumsy hand. Verified account Nov 21MoreTrue freedom and prosperity come not from the clumsy hand of the government - but from empowering people to control their own destinies through the dignity that is born of work. That "clumsy hand" of government has been steady enough to write him a paycheck and cover his and the family's expense for close to 30 years. A hand steady enough to guide his taxpayer-paid SUV caravans and the state airplanes he's gonna miss. ...take a look at the mess he made of a single follow-up question about US relations with Saudi Arabia, with its substantial civil liberties' deficits. Asked if he believed Saudi Arabia was a free and open country and what he made of the United States' relationship with that country, Walker said: "They're making a few moves right now but those are things that can be easily altered, at least in terms of Cuba. In terms of Saudi Arabia, we haven't — those are things I guess folks at the federal level would ultimately have to comment on in terms of whether it's consistency or not. "Again - that's a question you'll have to direct to them," said Gov. Walker. "The bottom line is the expectation, but if it's a company that - for legal reasons or otherwise - they'll have to answer the questions. They're the ones that handle that process. But, back to "the clumsy hand of the government." We know the clumsy hand of government is no match for the uplifting hadn't of the market place. We believe in a country where power is taken back from Washington and returned home to state and local governments where it is more effective, more efficient and more accountable to the people. Why? Because America deserves better. We believe in a country where freedom and personal success do not come from the clumsy hands of government rather from the dignity that comes from hard work. Now let's spend a little more time on those sentences, because in them and the rest of Walker's speech I see the seeds of his political collapse. Walker, the Republican incumbent, lost his bid for a third term yesterday by a 1.1 percentage point margin to Democrat Tony Evers. Health care, taxes, education, and immigration all were key issues in the campaign. But, as widely reported (see these excellent pieces in The Verge and the New Yorker) and discussed in this space last week, Walker’s cocktail napkin agreement with Foxconn, the Taiwanese company that is the world’s largest contract electronics manufacturer, proved a huge political albatross. We believe in a country where power is taken back from Washington and returned home to state and local governments where it is more effective, more efficient and more accountable to the people. Local officials and taxpayers with even a little information know that is a flat-out lie, as Walker's administration has relentlessly and with donor-driven intention taken away local controls. This article from 2016 says 99 times. This one says 128 times. (But wait, there's more, below). Why do you think all these local funding referenda passed on the same election where Walker got the boot? 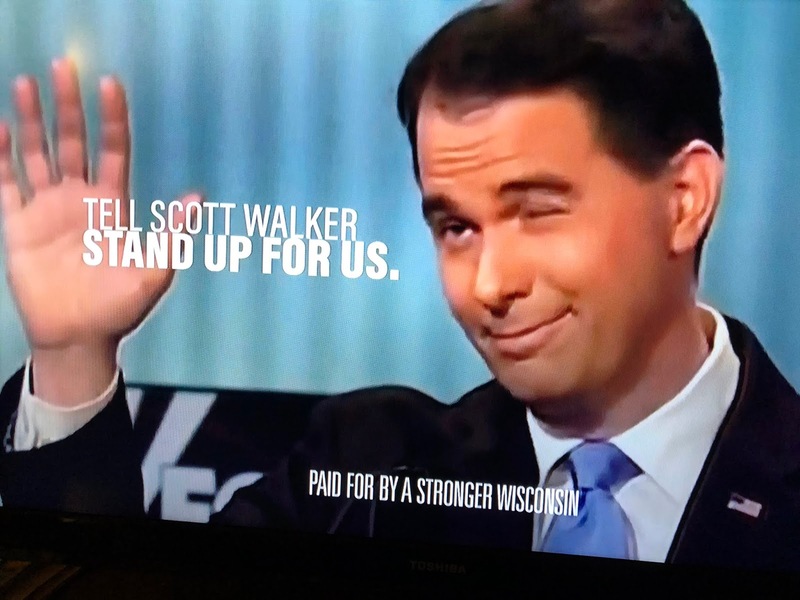 Because voters knew they again had to dig deeper locally to cope with the Walker-inspired funding cuts and restrictions in grassroots authority he and his party had counted on to bring in right-wing corporate money and set up bogus 'small government' campaign ad stock footage. A Portage County Board supervisor recently put it this way in a letter he wrote to GOP Assembly Speaker Robin Vos. Please get back to me as soon as possible with some answers with respect to how you and Sen. Fitzgerald intend to address the severe people's pushback against the measures you are scheming to introduce against the Governor-Elect. But even more importantly, what do you intend to do to reverse the "Legislative Power Grabs" of the past eight years, and restore the prior balance of powers among levels of government in Wisconsin? I would argue that Walker's two-year prostration before Trump cemented in that RNC appearance, all of the phoniness and deception Walker threw out there in a time slot he lobbied reinforced a self-made, unsavory and untrustworthy, slippery identity that Wisconsin voters could no longer stomach. So, wink-wink: who had the clumsy hand after all? What a bunch of crap. 95% baloney and a little reality. Foxconn is best deal in our histroy as it is agent for hundreds of businesses that will be coming here in next ten years. it has already started. Oh . . .gee thanks, “Anonymous “! I can really tell "Anonymous" is an unafraid, stalwart citizen that really researches hard facts before issuing detailed and fair opinions.